Understanding the complexity of innovation processes and unravelling the complicated relationships between innovation and productivity is pivotal to effective and purposeful public policy, designed particularly for economically lagging economies to initiate their swifter technology-induced growth and catching-up with richer economies. In this respect, the analysis focuses on machinery and equipment (M&E) acquisition as a key innovation strategy and uses a modified CDM model (Crépon et al., 1998). The model is extended by introducing binding financing constraints to shed light on the drivers and determinants of innovation inputs, the relationship between innovation input and innovation output and, finally, the relationship between innovation output and firm productivity. We consider three different economic phases, spanning from the early 2000s and the immediate pre-crisis period to the immediate post-crisis period. 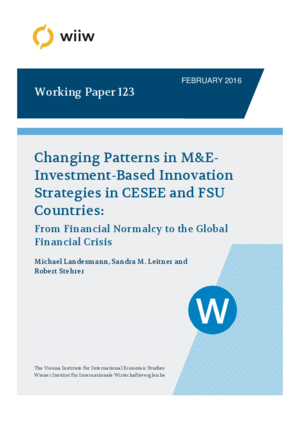 The analysis uses firm-level data for a large set of Central, East and Southeast European countries (CESEE) and Former Soviet Union countries (FSU) and demonstrates that financing constraints were non-negligible and very harmful, inducing entrepreneurs to be less likely to invest in M&E but also to invest less in the acquisition of M&E. Moreover, it points to the important role of M&E investment efforts for an establishment’s innovation success, suggesting that establishments with higher M&E investment effort are also more likely to become successful product innovators. Finally, it consistently demonstrates that successful innovative activities pay off, significantly enhancing innovators’ labour productivity levels.